Have you ever used parametric tests before? 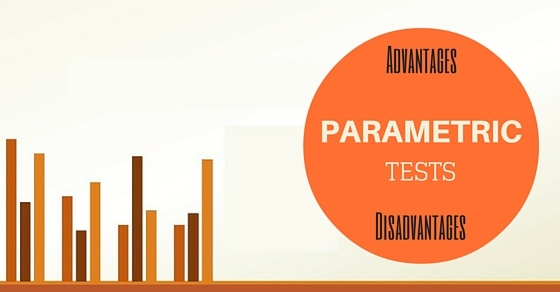 Are you confused on whether you should pick a parametric test or go for the non parametric ones? If that is the doubt and question in your mind, then give this post a good read. Usually, to select the best option, we have to check the advantages and disadvantages of nonparametric tests and parametric tests. In this article, we are going to talk to you about parametric tests, parametric methods, advantages and disadvantages of parametric tests and what you can choose instead of them. We have also thoroughly discussed the meaning of parametric tests so that you have no doubts at all towards the end of the post. So go ahead and give it a good read. Nonparametric tests process depends on few assumptions about the shape of the population distribution from which the sample was extracted. Conventional statistical procedures may also be called parametric tests. In every parametric test for example, you have to use statistics to estimate the parameter of the population. Because of such estimation, you have to follow a process which includes a sample as well as a sampling distribution and a population along with certain parametric assumptions which are required, which makes sure that all components are compatible with one another. An example can be used to explain this. Observations are first of all quite independent, the sample data doesn’t have any normal distributions and the scores in the different groups have some homogeneous variances. Parametric tests are based on the distribution, parametric statistical tests are only applicable for the variables. There are no parametric tests which exist for the nominal scale date and finally, they are quite powerful when they exist. One of the biggest and best advantages of using parametric tests is first of all that you don’t need much data that could be converted in some order or format of ranks. The process of conversion is something that appears in rank format and in order to be able to use a parametric test regularly you will end up with a severe loss in precision. Another big advantage of using parametric tests is the fact that you can calculate everything so easily. In short, you will be able to find software much quicker so that you can calculate them fast and quick. Apart from parametric tests, there are other non-parametric tests, where the distributors are quite different and they are actually not all that easy when it comes to testing such questions that are focused related to the means and shapes of such distributions. One of the biggest advantages of parametric tests is that they give you real information regarding the population which is in terms of the confidence intervals as well as the parameters. The parametric test can perform quite well when they have been spread over and each group happens to be different. While these non-parametric tests don’t really assume that the data follows a regular distribution, they do tend to have other ideas and assumptions which can become very difficult to meet. When it comes to nonparametric tests, you can compare such groups and create a usual assumption and that will help the data for every group out there to spread. In case the groups have a different kind of spread, then the non-parametric tests will not give you any proper results. On the other hand, if you use other tests, you may also go to options and check the assumed equal variances and that will help the group have separate spreads. Another benefit of parametric tests would include statistical power which means that it has more power than other tests. Therefore you will be able to find an effect that is significant when one will exist truly. Parametric tests are not valid when it comes to small data sets. The requirement that the populations are not still valid on the small sets of data, the requirement that the populations which are under study have the same kind of variance and the need for such variables are being tested and have been measured at the same scale of intervals. Another disadvantage of parametric tests is that the size of the sample is always very big, something you will not find among non-parametric tests. That makes it a little difficult to carry out the whole test. The best reasons why you should be using a nonparametric test is that they aren’t ever mentioned, especially not enough. In fact, they can also do a usual test with some non-normal data and that doesn’t mean in any way that your mean would be the best way to measure if the tendency in the centre for the data. For example, if you look at the centre of any skewed spread out or distribution such as income which could be measured using the median where at least 50% of the whole median is above and the rest is below. In case think you can add some billionaires to the sample, the mean will increase greatly even if the income doesn’t show a sign of change. Typical parametric tests will only be able to assess data that is continuous and the result will be affected by the outliers at the same time. The non-parametric tests may also handle the ordinal data, ranked data will not in any way be affected by the outliners. You have to be sure and check all assumptions of non-parametric tests since all have their own needs. This brings the post to an end. Hopefully, with this article we are guessing you must have understood the advantage, disadvantages and the uses of parametric tests. If you have liked the article and would like to give us some feedback, do let us know in the comment box below. We would love to hear from you. Also if you have questions in mind or doubts you would like to clarify, we would like to know that as well. On that note, good luck and take care.